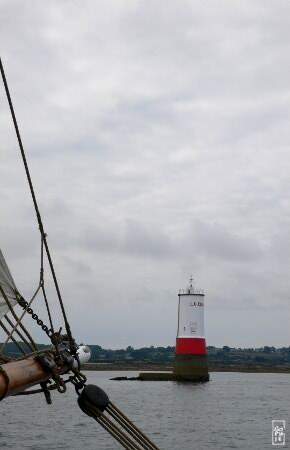 We leave the Tréguier river mouth, passing along the Corne lighthouse. Nous quittons l’embouchure de la rivière de Tréguier, en passant le long du phare de la Corne. 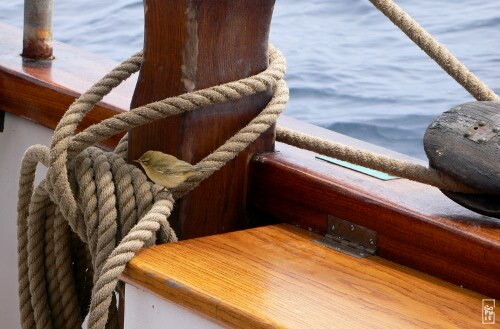 After making a good way north towards the Channel islands, we start to eat lunch, and I suddenly notice a tiny bird landing on a rope! Après avoir bien avancé vers le nord et les îles Anglo-normandes, nous commençons à déjeuner, et tout à coup je remarque un petit oiseau qui se pose sur un bout ! 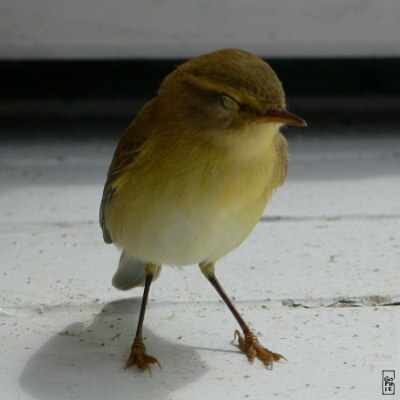 It seems to be a common chiffchaff, and the little guy looks pretty tired, I don’t know how far away he came from. Ça doit être un pouillot véloce, le pauvre petit a l’air bien fatigué, je ne sais pas de quelle distance il arrive. After a while, it wakes up and eats a few resident spiders. 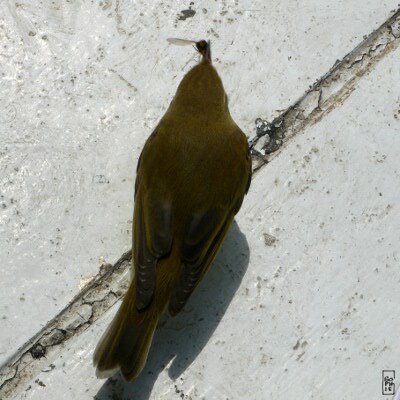 This quickly builds its energy reserves and it starts hunting for flying insects. It perches on a high part of the boat, and when an insect flys by, darts from its perch to catch it and get back on the boat. 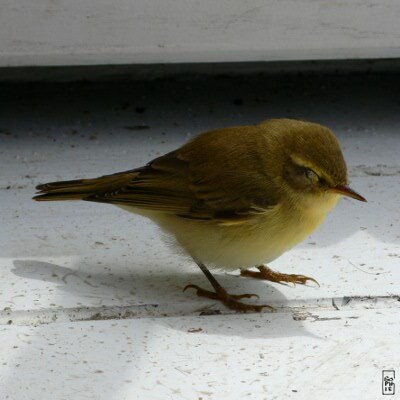 The French name of this bird includes the word quick, and it is indeed very quick. At one point, it uses the top of my head as a landing pad! Its little nails are pretty sharp. Après un moment, il se réveille et mange quelques araignées du bord. Cela recharge rapidement ses batteries et il commence à chasser des insectes volants. 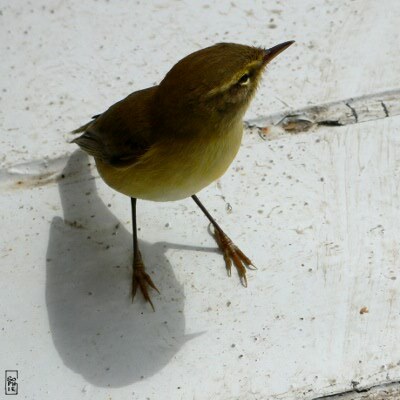 Il se perche sur un point haut du bateau, et quand un insecte passe, fonce pour l’attraper. Il mérite vraiment son nom de véloce. À un moment, il utilise le sommet de ma tête comme point d’atterrissage ! Ses petits ongles sont bien acérés.